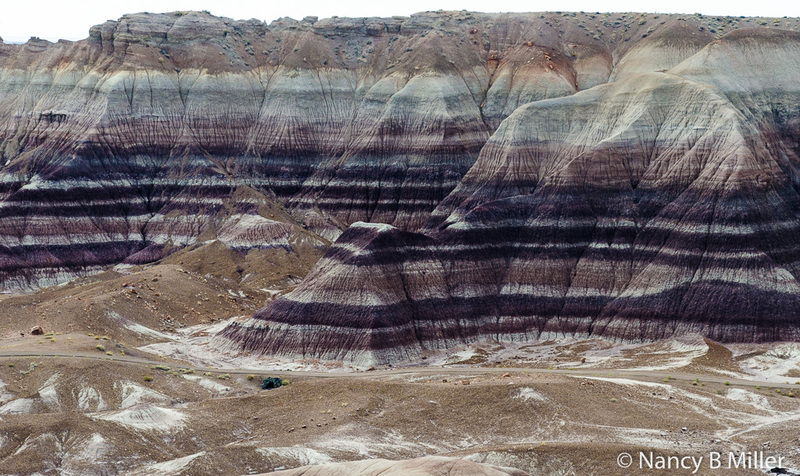 Imagine if an artist took a palette and brushed huge rock formations with a variety of colors. Picture civilizations dating back 13,000 years leaving remains of their homes and symbolic paintings. Transfer yourself back to a time where a vast area of trapped logs became buried in a swamp, then petrified. Do all this and you have captured the essence of Petrified Forest National Park, located 26 miles east of Holbrook, Arizona, along Interstate 40, in northeastern Arizona. All these natural and archeological wonders are best seen by driving the 28-mile park road, stopping at overlooks, and strolling some of the trails. 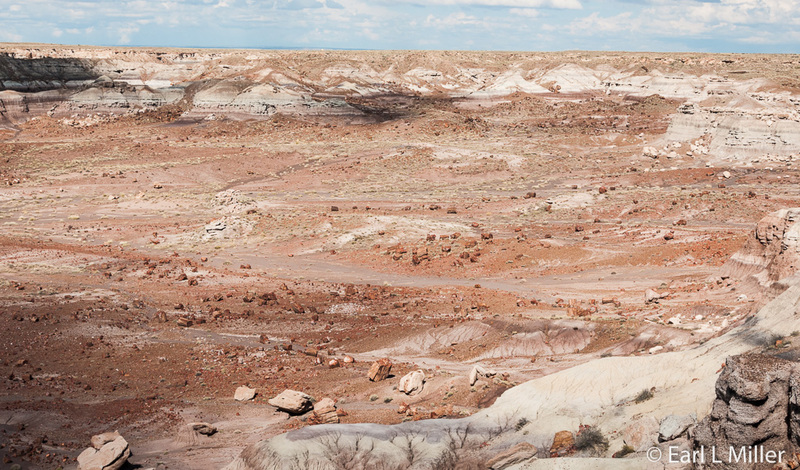 You’ll discover quickly, with so much to see and do, a full day is required to absorb Petrified Forest. Where you stop first depends on whether you access the Petrified Forest from the north or south. 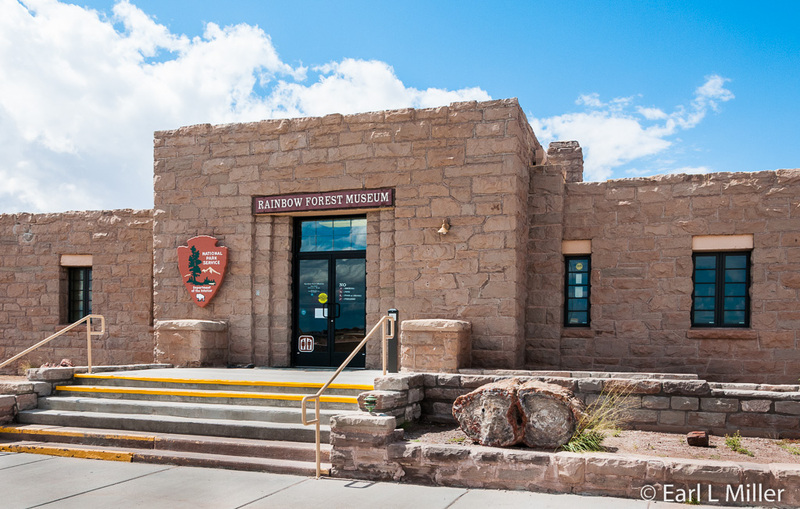 The Park has the Painted Desert Visitor Center at its north end and Rainbow Forest Museum at its south end. The museum has a small bookstore and restrooms. A gift shop and seasonal snack bar are located nearby. A restaurant, gift shop, gas station, post office, and convenience store are adjacent to the visitor center. Both facilities introduce you to the area with their 15-minute film “Timeless Impressions,” shown continuously. Their rangers are willing to provide brochures on the park and answer questions. I strongly recommend purchasing, from either location, their CD titled “Driving Tour - Petrified Forest, Painted Desert National Park.” It contains 23 tracks that provide an entertaining tour of the whole area and add greatly to an understanding of what you are seeing. This can be purchased at the gift shops of the museum and visitor center. It costs $10. 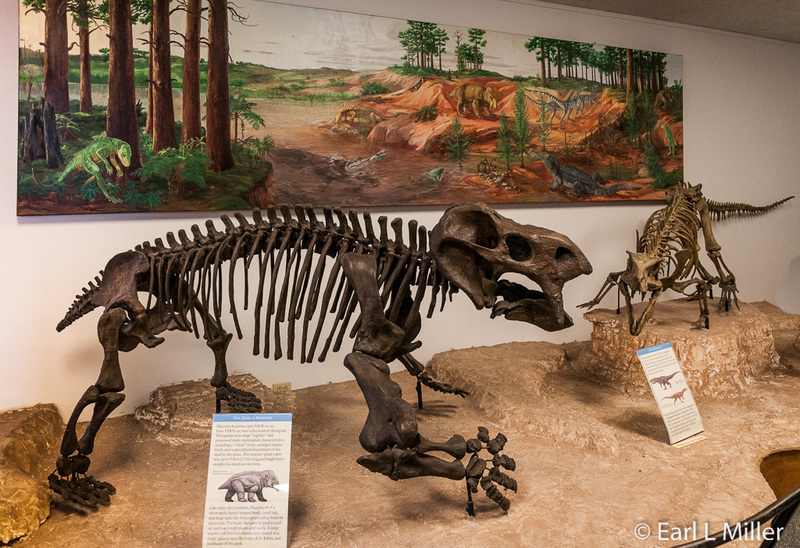 The museum contains exhibits of petrified wood and fossils and displays of prehistoric animals. We saw the skeletons of a Placeria Hesternus (like a mammoth in appearance), Rauisuchids (like a crocodile) and an Aetosaurus. Another room dedicated itself to how the area appeared during the Triassic Era and what creatures lived in it. 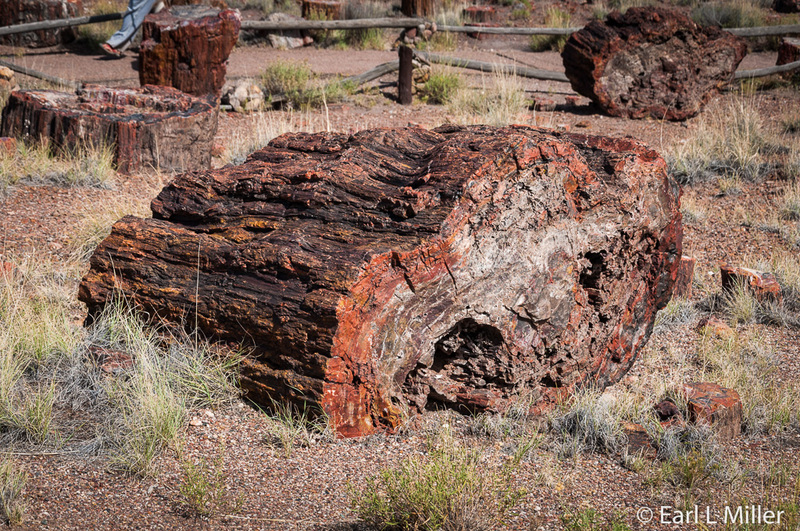 An easy way to see large amounts of petrified wood is by strolling the Giant Logs Trail, accessible by exiting the rear of the Rainbow Forest Museum. The trail is .4 miles and has stairs. At the top is “Old Faithful,” an extremely colorful log that is almost ten feet wide at its base. To appreciate what you are seeing, it’s important to know why these petrified logs are here and how the process happened. It’s hard to believe, but 216 million years ago, Earth had one supercontinent, Pangaea, during the late Triassic Period. Arizona, at that time, was located four degrees north of the equator. Its climate was humid and subtropical and the land consisted of a low plain, flanked by mountains to the south and southeast and a sea to the west. Streams flowed across this plain with many trees, both conifers and ginkgoes (related to cycads) growing on its edge. When they died, they often toppled into the water and were carried on journeys downstream by periodic floods. The water rose out of the river beds, spread over the flood plain, and deposited the trees that had become trapped. They were buried under silt, mud, sand, and volcanic ash. These deep burials protected them from bacteria and oxygen that would have caused their decay. Groundwater dissolved the silica in the ash, replacing the trees’ organic cells with quartz crystals, and causing their petrification. Traces of other minerals combined with the silica to create various colors in the petrified wood. For example, iron caused the bright mustard, orange, and reds. Manganese created the blue, purple, and black. The original carbon produced shades of gray. Purple amethysts, yellow citrine, and jasper also became embedded in these logs. Most of the park’s logs kept their external form but completely lost their internal structure. These are called pseudomorphs - copies of wood. A small number are partially mineral-filled but kept most of their original organic structure. This is called permineralization. These petrified logs are tan and brown and resemble modern wood. The trees remained buried in a clay tomb until the Colorado Plateau started pushing upwards some 60 million years ago. Centuries of erosion pushed downwards. These two forces met to reveal the remnants of this Triassic woodland. The logs you see in the park today don’t have bark, branches, or leaves. These tree parts decayed or were lost during their watery transport. Many petrified logs appear to have been cut by a giant chainsaw. However, they broke naturally. They’re very hard (They're 7.8 on the Moh scale; diamonds are 10.0) but brittle. During the earth’s movement, as the sediments shifted and settled, this placed the petrified trees under great stress. While still encased in rock, they developed cracks. Erosion exposed the logs, allowing the weather to widen the cracks. This was particularly true from ice wedging in them during the winter. Silica naturally breaks at a clean angle. 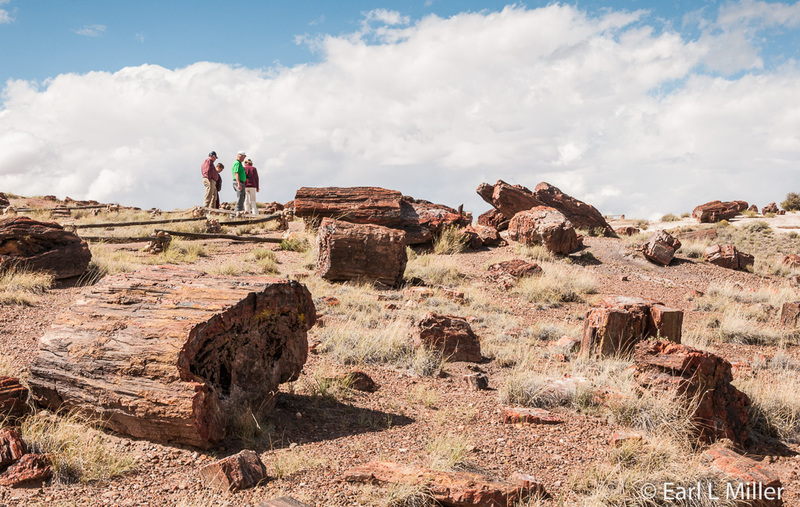 Petrified Forest National Park, covering 216 square miles, is known best as one of the largest collections on Earth of these petrified logs. However, it also has a wealth of other fossils. More than 250 fossil sites have been documented in the park. The first, a phytosaur skull, was discovered in 1919 near Blue Mesa in the Petrified Forest. Another early find was that of the skeleton of the Aetosaur Stagonolepis, a large, heavily armored reptile that ate plants. 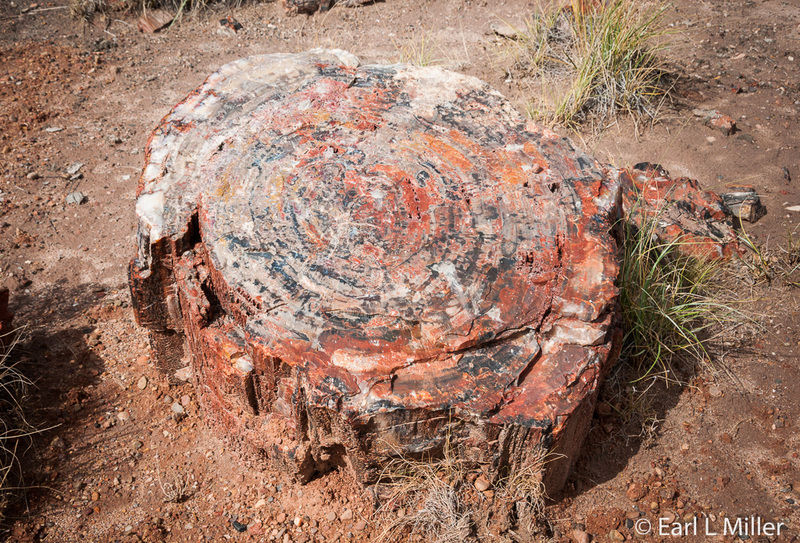 While upwards of a dozen types of petrified wood have been identified, two hundred species of plant fossils, including ferns and cycads, have been found. Animals include giant crocodile-like reptiles called phytosaurs, large salamander-like amphibians named Buettneria, and early dinosaurs. At the Rainbow Forest Museum, a whole room is dedicated to the remains of such creatures. The Long Logs trail can be accessed from the trailhead at the Rainbow Forest Museum parking area. 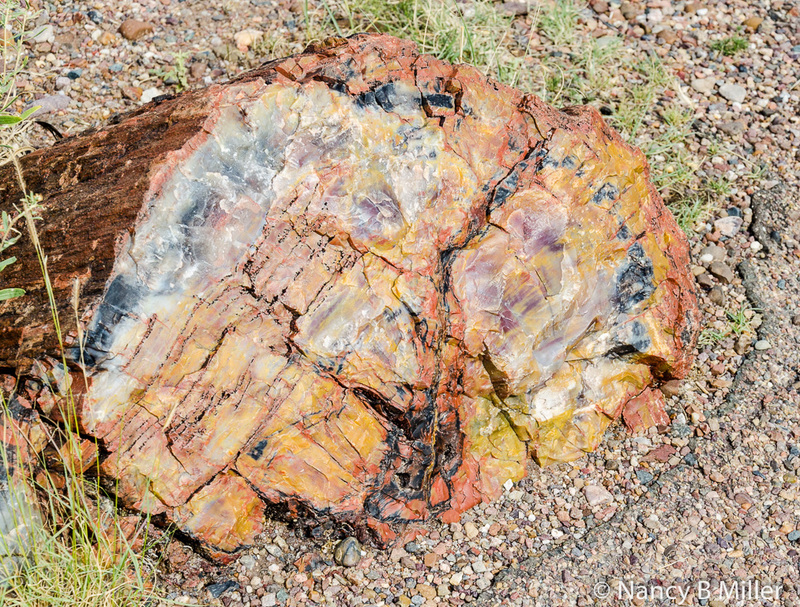 It’s a 1.6 mile loop that’s touted as one of the largest concentrations of petrified wood in the park. The first half-mile of the trail is paved. The other half is not advisable for mobility equipment due to its narrow width and very rough surface. We didn’t attempt it. Another trail for seeing these logs is the .75 mile loop from the Crystal Forest parking area. Unfortunately, many people have taken the wood from the park for more than a century, but you can still see lots of colorful petrified logs. Besides purple amethysts, some contain clear quartz which provided this area’s name. Removing petrified wood from the park is prohibited by law. Jasper Overlook provides a wonderful view of hundreds of petrified logs, once encased in the sandstone bluffs. Due to erosion, they’re now strewn across the valley below. To obtain a closer view, consider walking the 2.5-mile round trip along the old 1930's road into Jasper Forest. The Civilian Conservation Corp (CCC) constructed the gravel road in the mid-1930's. It was closed November 1965 and replaced by the upper road to the present parking lot and overlook. Still visible are many of the original stone culverts lining the old roadbed. The walk, although not difficult or steep, does require sturdy shoes . Footing can be difficult at any time. Do not attempt it in wet conditions. The Agate Bridge is a 110 foot petrified log spanning a gully. It resisted erosion and remained suspended when the soft rock underneath it eroded. In 1911, the park placed a masonry pillar underneath the log. The pillar was replaced by a concrete span in 1917. Today, the park would not have done this and would have let the natural state exist. 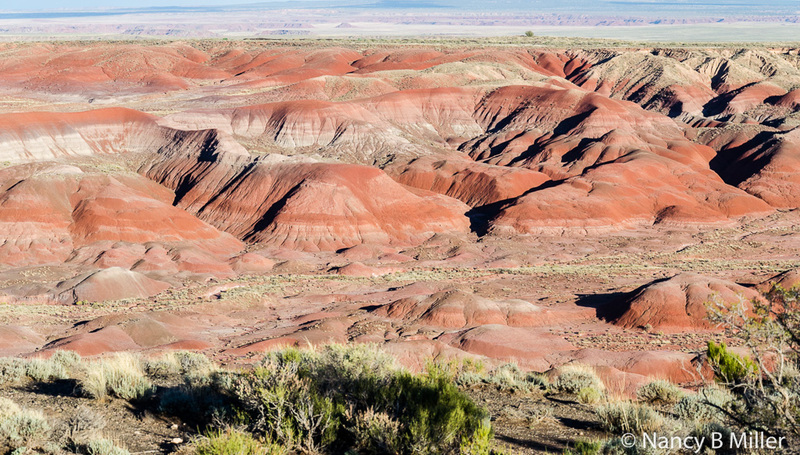 Another aspect of Petrified Forest National Park is its wealth of more than 600 archeological sites tracing back as early as 8,000 years ago from the Paleo Indians. Between 6000 B.C. and 1A.D., during the Early Basketmaker Era, nomadic groups established camps here from which they hunted small game and harvested seeds. During the Early Basketmaker II Era, 1 A.D. to about 800 A.D., they lived in pit houses at fewer than 100 sites and farmed. The Pueblo I Era existed between750 and 900 A.D. At this time, the Indians constructed aboveground homes and storerooms. More than 200 pueblo-builder sites have been identified in the park. Most were single-family homes. By 1250 A.D., as the soils became exhausted from farming, they chose large multi-room pueblos close to water instead. One of these you can view today is the Puerco Pueblo. It consists of a 100 to 125-room pueblo around an open plaza occupied between 1250 A.D. to 1380 A.D. It’s believed to have housed around 200 families. 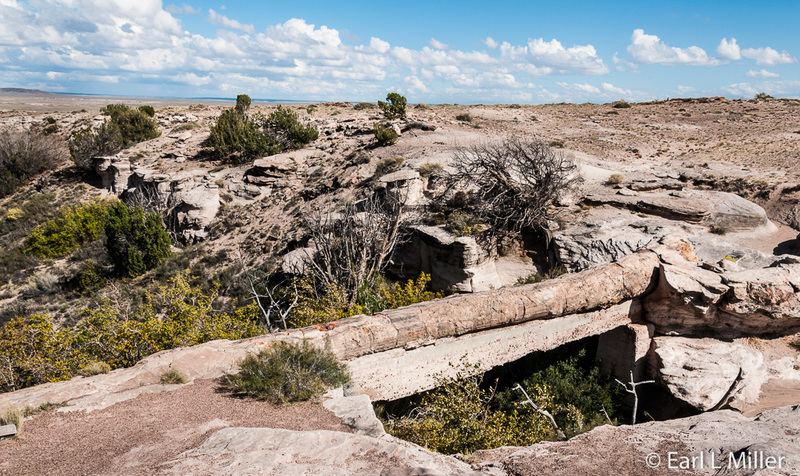 The Indians could only enter these structures by climbing ladders over the exterior walls and descending through the roofs since no windows or doors existed. Rooms around the plaza were used for storage and living quarters. Three underground, rectangular kivas have been identified. You can stroll a .3 mile loop leading from the Puerco Pueblo parking area to explore this site where you will see wayside signs and petroglyphs. The trail is paved and doesn’t have stairs. Another trail is the 2-mile round trip to the Agate House. 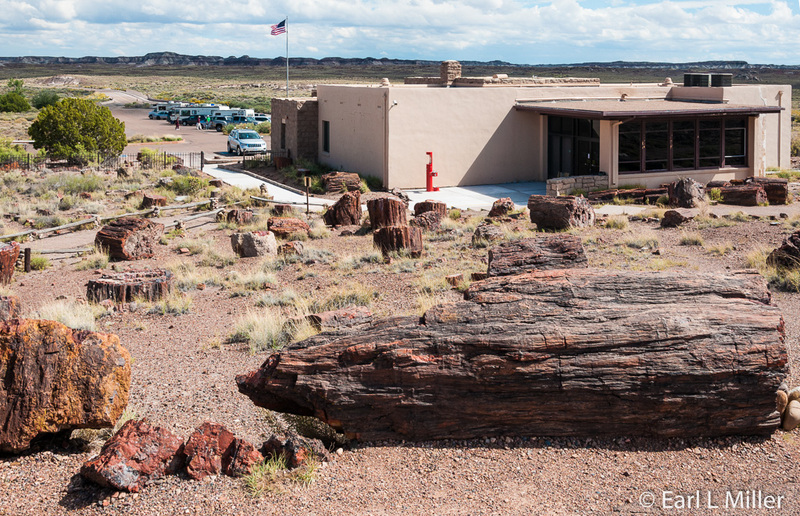 It’s a small, eight-room pueblo built of petrified logs. Archeologists believe seasonal farmers or traders may have built it as a year-round residential home about 900 to 1200 years ago. Others have suggested the structure had solely a ceremonial purpose. The age was determined based on the ceramics discovered at the site. The Agate House was excavated and reconstructed in 1933-34 by the CCC. It was listed on the National Register of Historic Places in 1975. The trailhead for the Agate House Trail is the Rainbow Forest Museum parking area. Only its first half-mile is paved. The rest has a narrow width and very rough surface, not suitable for mobility equipment. Professional archeological work started during the early 20th century with excavation at Puerco Ruin and other sites. Research in paleontology and archeology continues today. Puerco Pueblo and Newspaper Rock are great places to see petroglyphs. These are images, symbols, or designs that have been cut, scratched, or pecked onto rock surfaces. They are seen on a patina called desert varnish. Most of those in the park are between 650 and 2,000 years old. At Newspaper Rock, it’s a short stroll to where you can see, by using free spotting scopes, more than 650 petroglyphs adorning boulders below the overlook. If you have binoculars, they’ll come in handy here. For photography, you’ll need a strong telescopic lense. Due to the defacement of these petroglyphs and unstable hillsides, the park closed the area below the cliff. 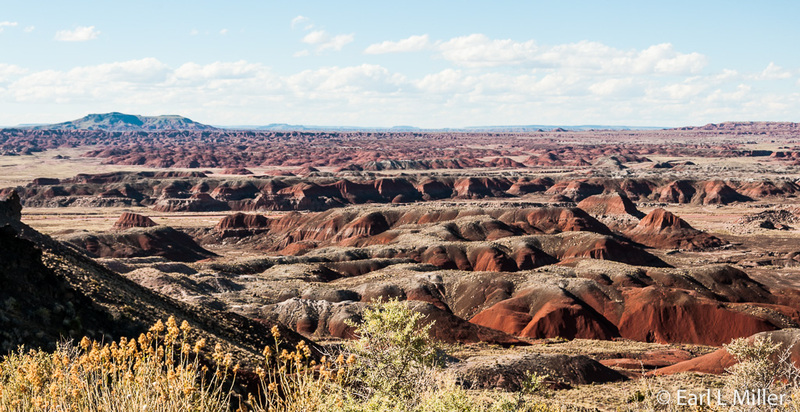 The Chinle Formation, with its colorful badland hills, flat-topped mesas, and sculpted buttes, makes up a large portion of the Painted Desert region of Arizona. The Chinle is composed of sandstone, mudstone, and conglomerates deposited by a large river system that had cycles of droughts and floods. You can see beautiful examples of this coloration at the Tepees and Blue Mesa. At these locations, the Chinle’s Blue Mesa Member of this formation consists of blue, purple, green, and grey colored mudstones and small grey and white sandstone beds. The best exposed of these is the Newspaper Rock Bed in the park’s Teepee area. The Tepees are recognizable by their cone shaped formations. At Blue Mesa, you’ll see the effects of erosion on Badland hills and a continuation of the coloration you saw at the Tepees. A one-way spur road leads to the mesa’s top, a four-mile round trip from the main park route. As you drive, you’ll see lots of petrified wood along the road and from the overlooks. The Chinle’s Owl Rock Member consists of orange-pinkish mudstones mixed with thin limestone layers. This member is found at the northernmost section of the park. You will also notice a lot of red and green colored layers. These layers contain the same amount of iron and manganese. The differences in coloration resulted from the groundwater table’s position when ancient soils were formed. In the soils, where the water table was high, the iron obtained a green or blue hue. Red soils formed when the water table fluctuated allowing the iron to rust. 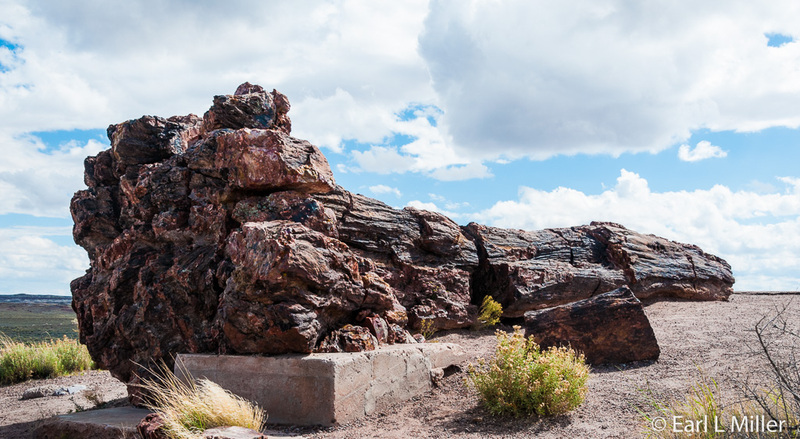 Tiponi, Tawa, Kachina, Chinde, Pintado, Nizhoni, Whipple, and Lacey Points are within a few miles of each other in the northern portion of Petrified Forest. While the coloration from adjacent overlooks may be the same, the perspective is not. So it is worth it to stop at as many of these points as possible. We were not there at sunset, but I have read that this is an incredible time to watch this breathtaking scenery. If you are in the mood for another hike, the one-mile, unpaved Painted Desert Rim trail has trailheads at Tawa and Kachina Points. It winds through a rim woodland for a chance encounter with many different kinds of plants and animals. It has a dirt gravel surface. A must stop to make in this area is the Painted Desert Inn National Historic Landmark located at Kachina Point. It’s a place to ask rangers questions and learn more about early tourism in the park, including the building. Though no longer an inn, it’s the home of the Cultural Demonstration Program providing a way for Navajo, Hopi, and Zuni artisans to share their history and traditional crafts during the summer, spring, and fall daily. Depending on who is at the inn that day, you’ll find a craftsman doing beading, silversmith work, traditional ceramic firing, basket making, or fetish carving. Herbert David Lore ran the inn, also known as “Stone Tree House,” from 1924 for 12 years. It was called that due to the petrified wood used in its construction. 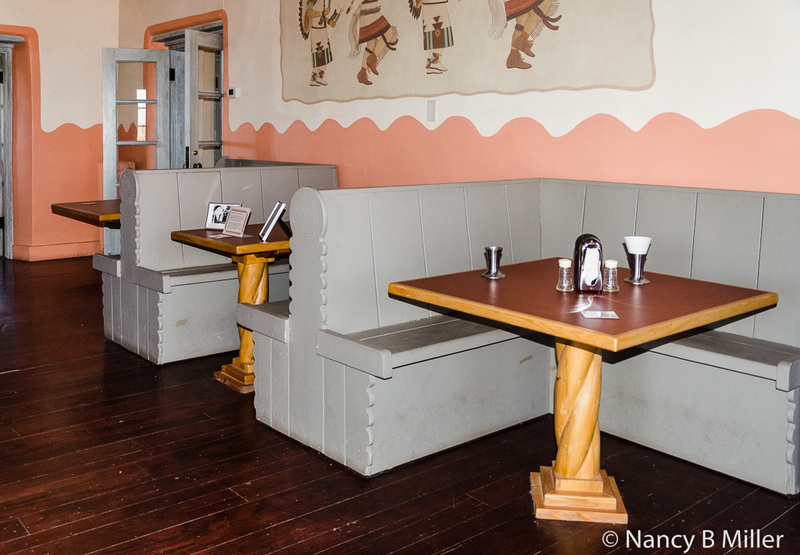 Visitors ate meals in the lunchroom, purchased Native American arts and crafts, or drank in the downstairs taproom. Six small rooms were available for two to four dollars a night. Unfortunately, Lore built his building on a bed on bentonite clay. When the clay shrinks and swells, it causes shifts in the inn’s foundation. This has caused cracks in the walls and water damage over the years. 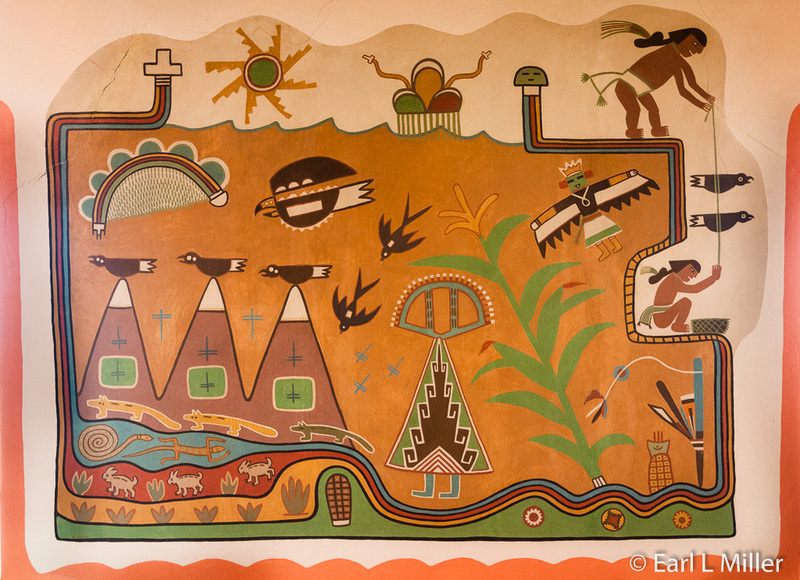 In 1936, the National Park Service purchased the Painted Desert Inn and four sections of land. Due to the inn’s structural problems and the popularity of the Pueblo Revival Style in the 1930's, National Park Service architect, Lyle Bennett, redesigned the inn. He was known for the Southwestern influence of his designs. The CCC made his plan a reality. The inn reopened for business July 4, 1940 under the management of Standard Concessions. It supplied Route 66 travelers with meals, lodging, and souvenirs. Local residents used it as a site for meetings and special events. With World War II, the CCC disbanded, travel curtailed, and the inn closed in October 1942. Fred Harvey Company reopened Painted Desert Inn in the late 1940s. Mary Colter, the company’s architect, arrived in 1947. She was already noted for her Southwestern concepts. Along with the renovations and repairs, she changed the color scheme and ordered plate glass windows placed in strategic walls of the inn to take advantage of the view. The Harvey Girls, who worked there during the 1940's and 1950's, stayed in some of the guestrooms. The company hired noted Hopi artist, Fred Kabotie, to paint murals on the dining room and lunchroom walls. The scenes depict Hopi and Puebloan culture: the Buffalo Dance, a trip to a sacred salt lake, planting time, and the Hopi sun god. These are still visible today. Severe structural damage to the inn forced the Fred Harvey Company to move to the visitor center in 1963. A debate went on for years whether the structure should be demolished or preserved. Due to a public campaign, the building was saved and listed on the National Register of Historic Places in 1976. It became a National Historic Landmark in 1987. The counters, chairs, and tables were reconstructed and replaced in 2009. The booths are original. 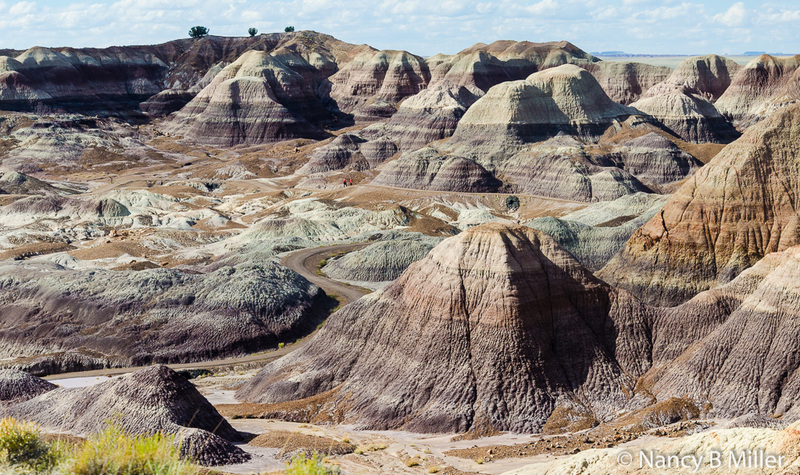 President Theodore Roosevelt created Petrified Forest National Monument in 1906. 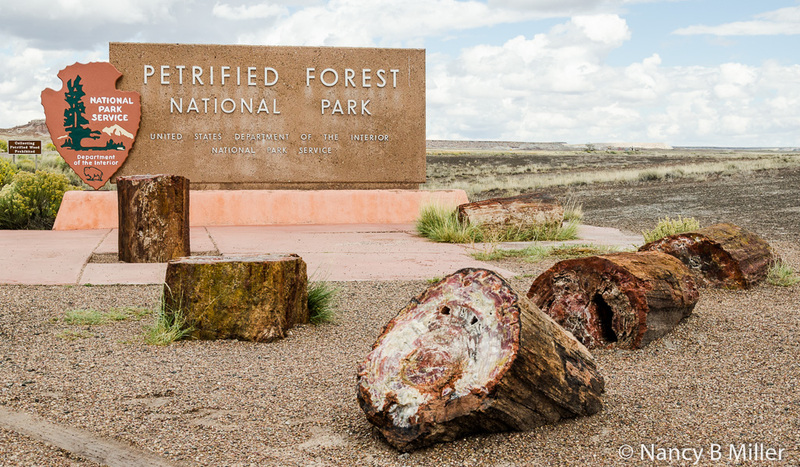 In December 1962, President Eisenhower established Petrified Forest National Park. In December 2004, President George W. Bush signed a bill to authorize more than doubling the size of the park. Pets are allowed on a leash on the trails but are not welcome in the buildings except for service animals. Admission is $10 for seven days by car. If you have a federal pass, admission is free. Park hours vary seasonally. The Visitor Center and the Rainbow Museum are open 8:00 a.m. to 5:00 p.m. daily. The Painted Desert Inn is open 9:00 a.m. to 5:00 p.m. daily. Petrified Forest National Park’s phone number is (928) 524-6228. 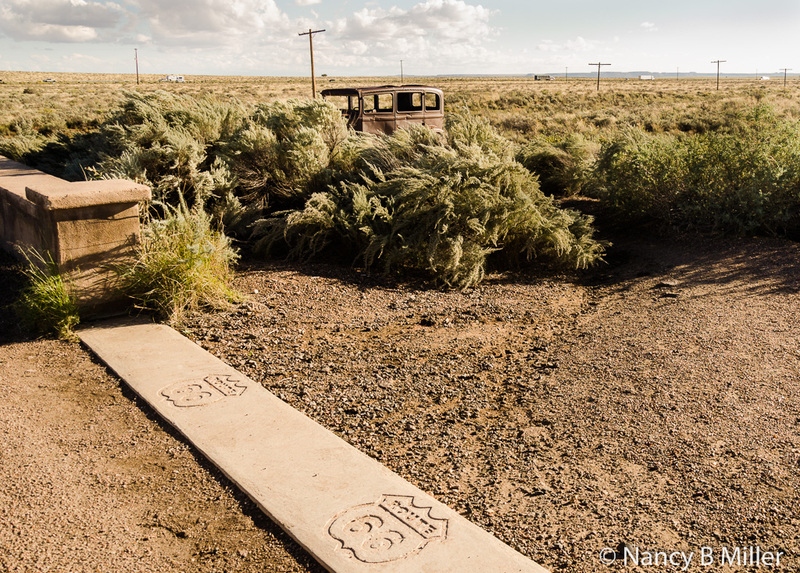 Petrified Forest is the only national park where you can see remains of Route 66.